WASHINGTON, DC – Outgoing 2016 National Council of Textile Organizations (NCTO) Chairman Robert “Rob” H. Chapman, III delivered the trade association’s 2017 State of the U.S. Textile Industry overview at NCTO’s 14th Annual Meeting on March 23 at the Capital Hilton in Washington, DC. Mr. Chapman’s statement outlined (1) U.S. textile supply chain economic, employment and trade data as well as (2) the 2017 policy priorities of domestic textile manufacturers. 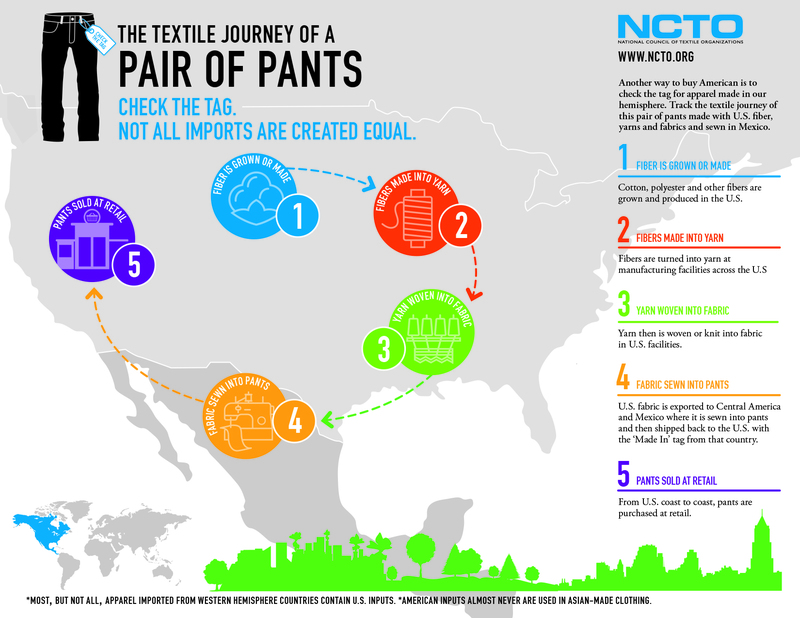 The text of his remarks as prepared for delivery are included in this press statement along with an economic data infographic and a “Check the Tag” illustration of U.S. textile industry’s trading relationship with Mexico. Mr. Chapman is Chairman and CEO of Inman Mills, a yarn and fabric manufacturer headquartered in Inman, South Carolina. How history went on to unfold reminds us of just how much change can occur in twelve months. And nowhere has change been more dramatic than in Washington, D.C. Unforeseen by most pollsters and pundits, the election of President Trump turned conventional political wisdom on its head and reignited debate on largely stagnant policy issues ranging from trade to tax and immigration reform. Consequently, if there was ever a time for the U.S. textile industry to fully marshal its resources and decisively engage in Washington, it is now. Thanks to the new Trump policy dynamic, the next twelve months represent the best opportunity in a generation to reorient U.S. manufacturing policy, level the playing field, and usher in a new era of growth for U.S. textile makers. In 2016, the value of U.S. man-made fiber and filament, textile, and apparel shipments totaled an estimated $74.4 billion, an increase of 11 percent since 2009. Capital expenditures also are healthy. Investment in fiber, yarn, fabric, and other non-apparel textile product manufacturing has climbed from $960 million in 2009 to $1.7 billion in 2015 – an increase of 75 percent. As we examine these employment figures, it is important to note that the heavy job losses incurred because of massive import surges in the 1995-2008 timeframe, virtually have stopped. Today, like most other U.S. manufacturing sectors, fluctuations in employment figures are generally due to normal business cycles, new investment, or productivity increases. U.S. exports of fiber, yarns, fabrics, made-ups, and apparel were $26.3 billion in 2016. Shipments to NAFTA and CAFTA-DR countries accounted for 56 percent of all U.S. textile supply chain exports. The United States is especially well-positioned globally in fiber, yarn, fabric, and non-apparel sewn products markets; it was the world’s 3rd largest individual country exporter of those products in 2015. Wrapping up the numbers, the fundamentals for the U.S. textile industry remain sound. This is true even though the U.S. market for textiles and apparel was soft in 2016. For the most part, the sluggishness was due to factors beyond the industry’s control: an underperforming U.S. economy, a weak global economy, and disruption within the retail sector as sales shift from brick and mortar outlets to the internet. With that said, the U.S. textile industry’s commitment to capital re-investment and a continued emphasis on quality and innovation make it well-positioned to adapt to market changes and take advantage of opportunities as 2017 moves along. That is why NCTO supported President Trump’s executive action to withdraw the United States from the twelve-country Trans-Pacific Partnership (TPP) even though NCTO had endorsed the agreement just one year earlier. One final trade priority is the enactment of a Miscellaneous Tariff Bill. NCTO strongly supports duty relief on manufacturing inputs that are unavailable domestically and do not compete with other U.S.-made products. Fostering a national culture of innovation is important too. In that regard, NCTO urges President Trump to nurture the Advanced Functional Fabrics of America or AFFOA project. This Defense Department program is matched three to one with private dollars and tasked with making it easier to develop and commercialize the next generation of high-performance textiles. Noting that the Trump administration and Congress appear serious about wanting to buy more American, NCTO would aggressively work to make sure textiles are included in any effort to enact commonsense laws or regulations that would strengthen “buy American” requirements applying to infrastructure or other federal spending. As demonstrated by Berry, when the federal government buys “American,” it is good for the U.S. textile industry and even better for America. Finally, the U.S. textile industry must acknowledge that its most valuable resource, its workforce, is aging. To keep thriving long term, American textile manufacturing must recruit a new generation of talented chemists, designers, engineers, skilled technicians, and semi-skilled labor. To this end, U.S. companies must continue to forge links with local leaders, schools, and government, vocational programs, community colleges, universities, and state business lobbies to make sure that state and federal policy produces a labor pool both adequate in size and well prepared to succeed in a hyper-competitive global economy. The industry’s need to attract America’s best and brightest is one reason why NCTO embarked upon the American Textiles: We Make Amazing rebranding campaign two years ago. NCTO is pleased to report the campaign is slowly but surely challenging outdated perceptions of the U.S. textile sector thanks to the fact that American textile manufacturers have a great story to tell. America’s textile industry is world class thanks to leveraging the most cutting-edge production processes, investing in the best machinery, and leading in sustainability and innovation. Judging by the earned media and social engagement generated by American Textiles: We Make Amazing marketing efforts, more and more people are hearing the good news and viewing the U.S. textile industry in a new light. Thank you for the opportunity to serve this great industry as Chairman of NCTO for this past year. It has been a privilege. Chairman – William “Bill” V. McCrary Jr.
o Mr. McCrary is Chairman and CEO of William Barnet and Son LLC, a synthetic fiber/yarn/polymer firm headquartered in Spartanburg, South Carolina with plants and/or offices in the Americas, Europe, and Asia. o Mr. Moran is CEO of Buhler Quality Yarns Corp., a leading fine-count yarn supplier with a manufacturing plant and its U.S. headquarters in Jefferson, Georgia.